De-skin, clean and rinse the chicken pieces. Marinate the chicken with the ginger, garlic, coriander powder and salt. Heat oil (or ghee) in a pan. Fry the onions, bay leaf, cardamom, and cinnamon for about a minute. Once the water starts to dry up, add the yogurt. Pour in a cup of water and mix well. Cover the pan and keep over low heat. After about 10-12 minutes, remove the cover and add in the milk and kewra. Stir some more and cover. 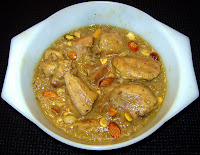 Once the gravy thickens, and the chicken is cooked, mix in the sugar, raisins and almonds.